The staff was friendly and accommodating. Hotel is clean, spacious, and quiet. Check in was very efficient. Where to find Solon hotels near an airport? Where can I find hotels in Solon that are near tourist attractions? If you're searching for great places to base yourself in Solon, you've got plenty to choose from. The Expedia database contains 29 comfortable places to unpack your bags within a 0.1-kilometre (0.06-mile) radius of downtown Solon. 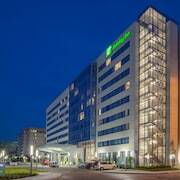 Accommodations that are within easy walking distance of the Solon city center, are the SpringHill Suites by Marriott Cleveland/Solon and Hampton Inn Cleveland-Solon. You could investigate the The Ritz-Carlton, Cleveland or the Cleveland Marriott Downtown at Key Center. 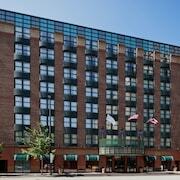 The The Ritz-Carlton, Cleveland is situated 25 kilometres (15 miles) away from downtown Solon. The Cleveland Marriott Downtown at Key Center, is located 25 kilometres (15 miles) away. If you'd prefer, you could book a bed at the InterContinental Cleveland or the Renaissance Cleveland Hotel. After you have seen Solon, why not take the time to investigate the wider region of the Northeast Ohio area. Visit Northeast Ohio's traditional villages and art galleries and also enjoy its rural landscapes and rolling hills. In this section of United States of America tourists may also try their hand at hiking. Downtown Cleveland is 25 kilometres (15 miles) to the northwest of Solon and is where you'll find Cleveland Police Historical Society, Inc. & Museum and Cleveland Public Library. 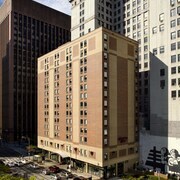 Downtown Cleveland hotel options include the Hyatt Regency Cleveland At The Arcade and Wyndham Cleveland at Playhouse Square. 25 kilometres (14 miles) to the north of Solon, you can also stay at East Side, home to the Courtyard by Marriott Cleveland Willoughby and Econo Lodge Wickliffe - Cleveland East. While in East Side, be sure to explore the Our Lady of Lourdes National Shrine and St Ann Shrine. Get your fix of local sport by making a trip to Quicken Loans Arena, which is 25 kilometres (15 miles) to the northwest of Solon. For those who are keen on sleeping close by, make a reservation in the Residence Inn By Marriott Cleveland Downtown or Aloft Cleveland Downtown. 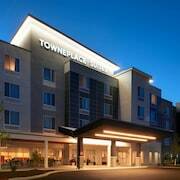 Situated 35 kilometres (20 miles) away from Solon is Hopkins International Airport. 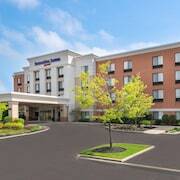 Stay nearby at Sheraton Cleveland Airport Hotel or Cleveland Airport Marriott. What are the most popular Solon hotels? Are there hotels in other cities near Solon? What other types of accommodations are available in Solon? Explore Solon with Expedia.ca’s Travel Guides to find the best flights, cars, holiday packages and more!